• Unmarked text is read with Esther melody. • Text marked in violet is read with the Esther melody for the end of a chapter (in communities where said melody differs). • Text marked in black is read with Eicha/Lamentations melody. • Text marked in blue is read using a variation of the “introduction” or “greeting” melody, a niggun found in several locations in Esther. Some liberties may be taken for effect. Below, Binder’s transcription. • Text marked in yellow is read using the “LaY’hudim Haytah” melody, since its words are key to the entire story. Below, Binder’s transcription. • Text marked in green is read using melodic motifs from the Pilgrimage Festival services. • Text marked in grey is read in a fast monotone, as one reads the list of the sons of Haman. And it was in the days of President Washington of all the United States of America. The very Washington who governed from Massachusetts to Georgia, thirteen states. And it was, in those days, there was a settlement of Jews in the port city named Newport in the state of Rhode Island. And behold, these Jews were congregating in the synagogue that was theirs and it was called the House of Touro. And there was a great war between the Americans and the English. And the Holy One saved President Washington from the hand of England and from the hand of her destructive king, along with all the Americans and all the Jews. And all the Jews in the United States of America rejoiced. And it was, after these things, that much confusion and contention arose in the land, yet the laws of freedom had not yet been passed. And the Jews worried greatly, for they did not know if salvation and safety would arise from President Washington or from the confused government. Sir: Permit the children of the stock of Abraham to approach you with the most cordial affection and esteem for your person and merits — and to join with our fellow citizens in welcoming you to NewPort. With pleasure we reflect on those days — those days of difficulty, and danger, when the God of Israel, who delivered David from the peril of the sword, — shielded Your head in the day of battle: — and we rejoice to think, that the same Spirit, who rested in the Bosom of the greatly beloved Daniel enabling him to preside over the Provinces of the Babylonish Empire, rests and ever will rest, upon you, enabling you to discharge the arduous duties of Chief Magistrate in these States. Deprived as we heretofore have been of the invaluable rights of free Citizens, we now with a deep sense of gratitude to the Almighty disposer of all events behold a Government, erected by the Majesty of the People — a Government, which to bigotry gives no sanction, to persecution no assistance — but generously affording to all Liberty of conscience, and immunities of Citizenship: — deeming every one, of whatever Nation, tongue, or language equal parts of the great governmental Machine: — This so ample and extensive Federal Union whose basis is Philanthropy, Mutual confidence and Public Virtue, we cannot but acknowledge to be the work of the Great God, who ruleth in the Armies of Heaven, and among the Inhabitants of the Earth, doing whatever seemeth him good. For all these Blessings of civil and religious liberty which we enjoy under an equal and benign administration, we desire to send up our thanks to the Ancient of Days, the great preserver of Men — beseeching him, that the Angel who conducted our forefathers through the wilderness into the promised Land, may graciously conduct you through all the difficulties and dangers of this mortal life: — And, when, like Joshua full of days and full of honour, you are gathered to your Fathers, may you be admitted into the Heavenly Paradise to partake of the water of life, and the tree of immortality. And Moses Seixas wrote and signed and sent this letter in the sixth month – that is, the month of Elul, on the seventh day therein, for the sake of the Hebrew Congregation of Newport. And the city of Newport hoped in the God of their Ancestors, to see what would be written from the hand of President Washington. And it was, once they had sent that letter, that a boat came to the port of Newport. And on it – Jefferson, Clinton, Blair, Loughton-Smith, Jackson, Humphreys, and Nelson Jr. – seven officials of the United States of America, and in their midst stood President Washington! And Washington walked through the city in the sixth month, that is, the month of Elul, on the seventh day therein. And it was, when the time for afternoon-prayers came, President Washington approached the government house of the city of Newport before all the people of Newport, and they made him a feast, and they ate and they drank. And behold, President Washington was coming to the synagogue, the House of Touro, and Moses Seixas met him and read to him the words of that letter he had written. And it was at that time that President Washington was happy and of a jolly heart. And President Washington blessed the whole city of Newport and said, “May the honor of the last be greater than the first!” And all the people of Newport rejoiced and were happy, and the congregation of the Jews that was in the city of Newport rejoiced even more, for the Holy One had made them the head and not the tail, and they were the top and not the bottom. 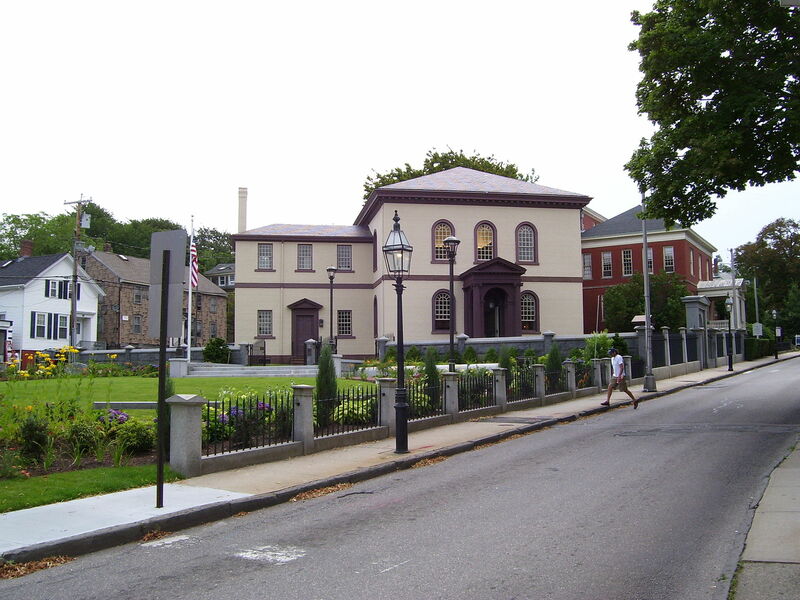 To the Hebrew Congregation in Newport Rhode Island. Gentlemen, While I receive, with much satisfaction, your Address replete with expressions of affection and esteem; I rejoice in the opportunity of assuring you, that I shall always retain a grateful remembrance of the cordial welcome I experienced in my visit to Newport, from all classes of Citizens. The reflection on the days of difficulty and danger which are past is rendered the more sweet, from a consciousness that they are succeeded by days of uncommon prosperity and security. If we have wisdom to make the best use of the advantages with which we are now favored, we cannot fail, under the just administration of a good Government, to become a great and happy people. The Citizens of the United States of America have a right to applaud themselves for having given to mankind examples of an enlarged and liberal policy: a policy worthy of imitation. All possess alike liberty of conscience and immunities of citizenship. It is now no more that toleration is spoken of, as if it was by the indulgence of one class of people, that another enjoyed the exercise of their inherent natural rights. For happily the Government of the United States, which gives to bigotry no sanction, to persecution no assistance, requires only that they who live under its protection should demean themselves as good citizens, in giving it on all occasions their effectual support. It would be inconsistent with the frankness of my character not to avow that I am pleased with your favorable opinion of my Administration, and fervent wishes for my felicity. May the children of the Stock of Abraham, who dwell in this land, continue to merit and enjoy the good will of the other Inhabitants; while every one shall sit in safety under his own vine and fig-tree, and there shall be none to make him afraid. May the father of all mercies scatter light and not darkness in our paths, and make us all in our several vocations useful here, and in his own due time and way everlastingly happy. Thus ended the letter of President Washington. And all the community of the Jews in the city of Newport finished reading that letter, and were happy and rejoiced. For behold – they knew that the community of the Jews who dwelt in the United States of America would be protected under the wings of a government that would listen and obey the voice of the people for eternity. And much time passed, and there was a new law that was written in the book of the chronicles of the presidents of the United States of America. So be it, they would make one day out of the Thursdays of the weeks after the harvest and before the winter to give thanks for all the good that had been given. So the Jews of the United States of America established and received it upon them and upon their descendants and upon all who would join them, not to be passed, that so be it, they would make this one day as it is written and at its time, year after year. And this day is remembered and done in every generation and generation, family and family, state and state, and city and city in the land of America, and this very Day of Thanksgiving will not be passed from the midst of the Jews of the United States of America, and its memory will not end from their descendants. These, this translation and this framework, were completed by Yitsḥaq Har’el ben Avraham Me’ir haKohen, a man of San Diego. In the year 5779 according to the count of the creation of the world. Blessed be the Holy One who taught my hand to bring close from on high all blessing and praise, amen, amen, selah. In many Jewish communities around the world, there have been traditional scrolls read for “local Purims,” celebrating redemptions for a specific community. Here in America, we don’t really have an equivalent to that. But we do have Thanksgiving, a day heavily inspired by Biblical traditions of celebration, and one long associated with all that is good about America. Some Jewish communities have a tradition on Thanksgiving of reading Washington’s letter to the Jews of Newport, where he vows to support freedom of religion, famously writing that the United States “gives to bigotry no sanction, to persecution no assistance” – thus rephrasing words originally written in a prior letter by Moses Seixas (say-shas), the sexton of the Touro Synagogue in Newport. This text includes the original English of both Moses Seixas’ letter to Washington and Washington’s return, as well as a somewhat simplified version of the story of Washington’s visit to Newport. Inspired largely by the style of the Book of Esther, it could be read on Thanksgiving morning during the service, using Esther melodies (or going on detours as per personal choice). One important note: the name “Washington” has been consistently written here as וָשִׁעְתּוֹן, which in Modern Hebrew would be pronounced “Vashi’ton.” This was purposeful. In the traditional Spanish-Portuguese pronunciation of Hebrew that was used at the Touro Synagogue at the time, the letter ע would have been pronounced as a velar nasal – as in “singing.” Thus, the community’s own record of the name “Washington” would have used ע rather than a נג combination. “מְגִלַּת וָשִׁעְתּוֹן | Megilat Washington: A Scroll for Thanksgiving, by Isaac Gantwerk Mayer” is shared by Isaac Gantwerk Mayer with a Creative Commons Attribution-ShareAlike 4.0 International copyleft license. Please reciprocate for any adaptation or redistribution of this work by (1) properly attributing the work to Isaac Gantwerk Mayer, (2) clearly indicating the date you accessed the resource and whether any changes have been made (and if so, please be in touch with us and leave a comment below so that we might note your adaptation or improvement), (3) providing a link back to this source, and (4) specifying the under which this work was shared.